Here are nine findings from the report that ecommerce merchants can put to use to improve their Twitter marketing efforts. 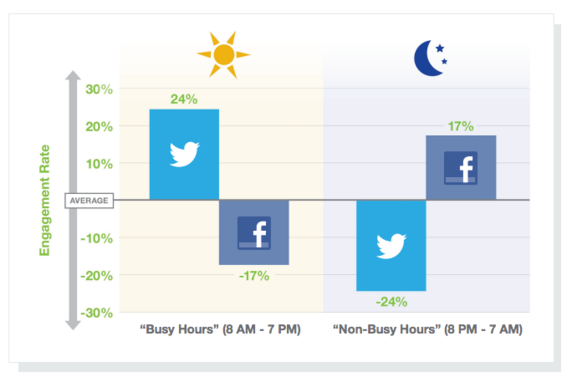 According to the report, Twitter engagement rates for brands are 17 percent higher on weekends compared to weekdays. Yet, most companies almost completely ignore this trend preferring to post during the week, when engagement rates are lower. 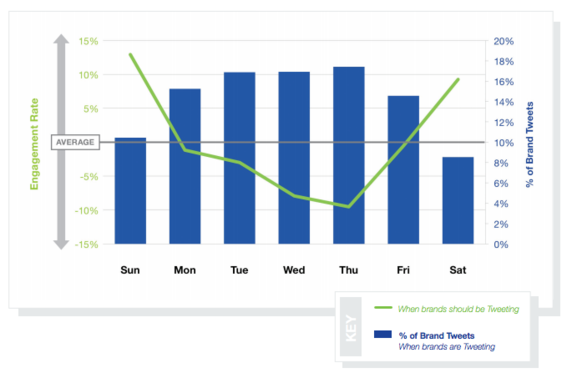 Twitter engagement rates for brands are 17 percent higher on weekends. 2. Tweet from 8 a.m. to 7 p.m. The Buddy Media report refers to these as “busy hours” and encourages posting during those times, versus evening hours when people are less active on Twitter. The rationale is that Twitter posts are more short-lived than posts to other social networks — such as Facebook — and are less likely to be noticed during off-peak times. Conversely, Facebook engagement goes up during nighttime hours, according to the report. So it may be helpful to separate Twitter and Facebook posting to coincide with optimal times for each channel. I’ve previously described social media management tools that enable merchants to schedule posts to publish at times that are best suited to each platform, in the following articles. “4 Essential Social Media Tools”. Tweet during daytime hours, as opposed to evenings. Management tools such as HootSuite and Sprout Social have built-in analytics components, which merchants can use to gain insights into the days and times when tweets receive the most engagement in the form of retweets and replies. Even when tweeting at optimal times, there is an inverse relationship between daily posting frequency and engagement. The more one tweets per day, the less engaging those tweets become, says the report. While it’s useful to tweet multiple times per day, don’t fill up followers’ Twitter feeds with too many posts. You stand the chance of your tweets being ignored or, worse, becoming unfollowed. Even though Twitter only allows 140 characters, it’s best to keep posts less than 100 characters in length. Those that fit this criteria receive 17 percent higher engagement than longer tweets, according to the report. Tweets that contain links receive as much as an 86 percent higher retweet rate than those that do not. When possible, include a link along with a short, enticing description. It could mean more traffic to your ecommerce site as a result. Be sure to test the link before posting. Hashtags have become a staple among Twitter users and with good reason. They receive twice the engagement than tweets without hashtags. Even so, only 24 percent of tweets contain hashtags. However, do not overuse hashtags as that can be confusing to the reader. Keep it to one or two per tweet. Even though users can’t immediately see an image in a tweet, images increase engagement rates up to two times higher than tweets that lack them. Twitter clients such as TweetDeck, HootSuite and Twitter.com make it easy to add images. If a tweet contained interesting content, people would presumably retweet it to their followers. That is not necessarily the case. Therefore, it is useful to include calls to actions and encourage such activity. Phrases such as “please retweet” have been shown to increase retweet activity by as much as 12 times. Though Twitter use by ecommerce merchants is commonplace, those who put these nine guidelines into practice may experience an uptick in engagement. Who is Using Twitter and Why?